Want to save another 10%? Save 10% an Additional 10% on ThermoWorks Purchases – for HBF Readers! This entry was posted in Great Deals, Ships to Canada, Thermometers, ThermoWorks on April 20, 2019 by admin. The ChefAlarm from ThermoWorks (the folks behind the nearly universally lauded Thermapen) is a great Thermometer and Timer Combo for homebrewing. It tracks both highs and lows, has both high and low alarms and has a built in timer. It has an easy to read screen with backlight. Check out my Full Hands on Review for more info. I recommend the immersible Pro-Series Needle Probe or the longer 12″ (non-immersible) probes, both are available on the accessories tab. ThermoWorks is having a Private Open Box Sale, marking this down to just $49.28. These come with a full manufacturer’s warranty. Note that you must use this Private Sale Landing Page as they standard product page will not show the discount. Want to save another 10%? Save 10% an Additional 10% on ThermoWorks Purchases – that makes this $44.35 for HBF Readers! This entry was posted in Great Deals, HBF Tested, Ships to Canada, Thermometers, ThermoWorks, Timers on April 19, 2019 by admin. 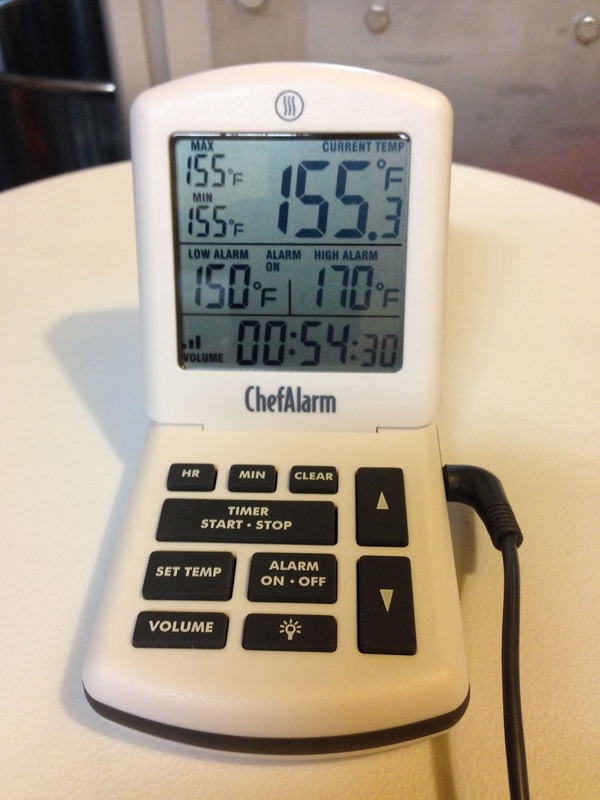 The ChefAlarm Thermometer and Timer Combo from ThermoWorks has some unique features, including the ability to set both high and low temperature alarms. Other features include: Constant Minimum and Maximum Temperature Displays, User Calibration, Adjustable Alarm Volume, Backlighting and the unit is Splash Proof. All of this lends itself to making this thermometer and timer combination an amazing tool for homebrewers. Here’s a Hands on Look at the ChefAlarm along with the optional Pro-Series Temperature Probe. This entry was posted in Great Deals, HBF Tested, Review Updates, Thermometers, ThermoWorks, Timers on April 17, 2019 by admin. This entry was posted in Great Deals, HBF Tested, Ships to Canada, Thermometers, ThermoWorks, Timers on April 17, 2019 by admin. Max temperature function: it can take the highest temperature of the area tested by scanning and save the data at the bottom of the screen. EMS adjustable function: each object has its suitable emissivity, the adjustable emissivity function can make the test more accurate by adjust suitable emissivity for different objects. U.S. FDA, FCC, CE, ROHS approved. This entry was posted in Amazon, Amz, Great Deals, Infrared Thermometers, Thermometers on April 10, 2019 by admin. Ultra fast 2-3 second readings with an accuracy better than ±0.9°F. Large backlit ambidextrous 1.4″ display and IP67 splash-proof construction. Features include depth gauge, temperature hold, temperature alarm, MIN/MAX. Integrated magnet for convenient storage on refrigerators or ovens. Available in 3″ compact or 4.5″ regular versions perfect for fryers, bread, candy, coffee, and homebrews. This entry was posted in Amazon, Thermometers on April 1, 2019 by admin. Kizen Instapen Pro Instant Read Meat Thermometer – Best Waterproof Thermometer with Talking Function, Backlight & Calibration. Digital Food Thermometer for Kitchen, Outdoor Cooking, BBQ, and Grill! ULTRA FAST – Takes a temperature in a little as 2-3 seconds, and is accurate to +/-1 degrees with a wide range of -58℉-572℉. No more waiting over a hot stove or grill for the temperature to settle! Take out the guesswork and eliminate overdone or undercooked food, and instead make perfectly cooked beef, chicken, pork, fish, lamb, or turkey, every time! Also works great with beverages, deep frying, making candy, and baking. WATERPROOF – IP67 rated waterproof, the Kizen thermometer can be washed under running water without fear! With a strong ABS plastic body, it can withstand accidental drops or other impact accidents. With a waterproof and strong break resistant body, the Kizen thermometer is highly durable and resilient. CONVENIENT & CLEAR – Get the temperature by voice or bright LCD screen instead of fumbling with your phone flash to get a read! This is a must have tool for any cooking situation, whether you are out for a night BBQ, in your kitchen, taking a temperature in a dark oven, or anywhere vision might be impaired, simply turn on the bright blue back-light or push the voice button to have it spoken to you. Alpha Grillers Ultra Thermometer. Displays in deg F and deg C. Auto shut off and hold features. Use for measuring yeast rehydration water temp, wort temp, mash temp and… more. CONVENIENT AND CLEAR – Get the temperature by the bright and large LCD screen instead of fumbling with your phone flash to get a read! With an internal magnet and large hang hole, you can conveniently store this where you can have easy and quick access! Further convenience in the form of an alarm that can be set to sound at your desired temperature.